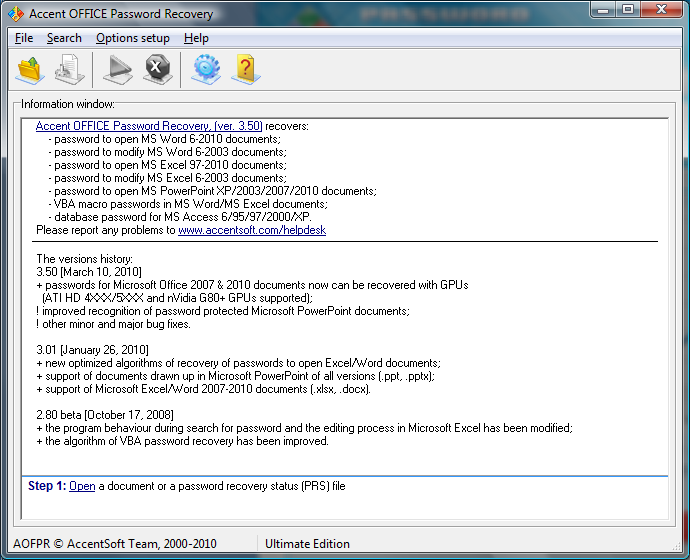 An amazing solution to the problem of lost MS Office / OpenOffice passwords is right here: www.passwordrecoverytools.com. The program works with all versions of Mirosoft Office (95-2010) and OpenOffice. It knows most types of protection for these documents. It uses ATI and NVIDIA video cards to break Office 2007/2010 passwords. It makes password search up to 60 times faster. It requires neither special knowledge nor learning. It solves the problem of lost MS Office and OpenOffice passwords. GPU-boosted. ...... It recognizes Access, Excel, PowerPoint and Word documents. And it also knows the OpenOffice format and recovers passwords to Writer, Calc, Impress, Base, Draw and Math documents. Accent OFFICE Password Recovery breaks most types of protection for all these documents. Accent OFFICE Password Recovery instantly recovers many password types for Microsoft Office documents: VBA passwords, passwords to modify, passwords to Excel sheets, passwords to open Access databases. Accent OFFICE Password Recovery uses optimized algorithms taking into account the peculiarities of the computer and its CPU to break hard-to-recover passwords. Tests show that program is the leader concerning how fast it finds Microsoft Office and OpenOffice passwords. Supported ATI and NVIDIA video cards! Qweas is providing links to Accent OFFICE Password Recovery 5.1 as a courtesy, and makes no representations regarding Accent OFFICE Password Recovery or any other applications or any information related thereto. Any questions, complaints or claims regarding this application Accent OFFICE Password Recovery 5.1 must be directed to the appropriate software vendor. You may click the publisher link of Accent OFFICE Password Recovery on the top of this page to get more details about the vendor.